By simply clicking on any of the below photos, they may be seen in high resolution, and either downloaded or copied, should you care to have them for your personal use. 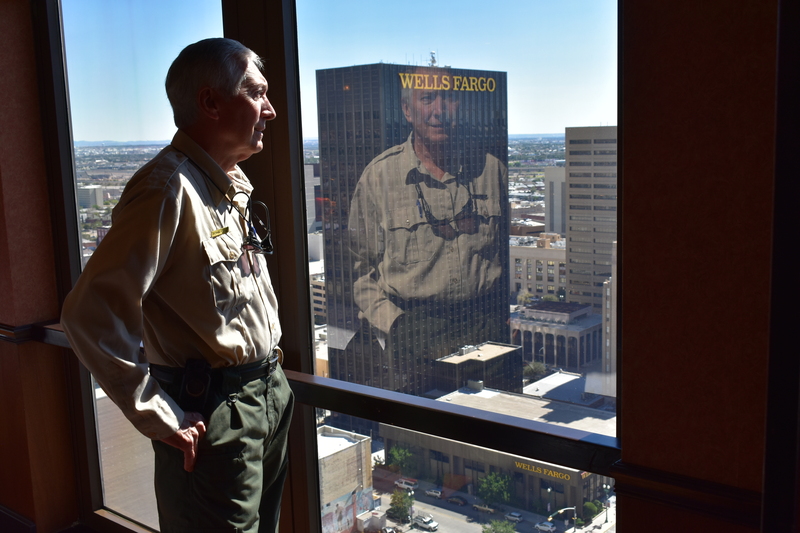 John Read, one of the FASF’s original members, long time historian on the Punitive Expedition, and Chief Ranger at the New Mexico Pancho Villa State Park in Columbus, looks out over El Paso and into Juarez, Mexico, from the El Paso Club, where he just presented a special progam to the Daedalian Society’s Flilght 24. 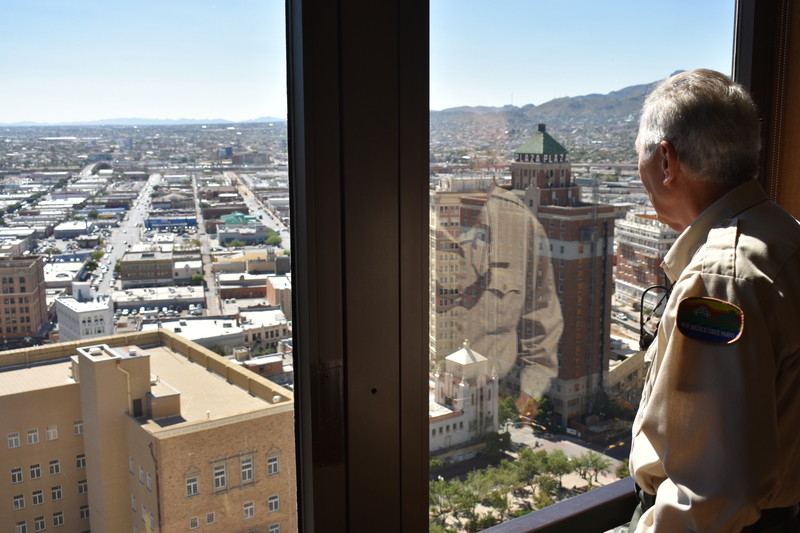 John takes in more of the spectacular view to the South over El Paso, from the El Paso Club’s picture windows. The Daedalian Flight meets once a month to listen to educational presentations from local leaders. 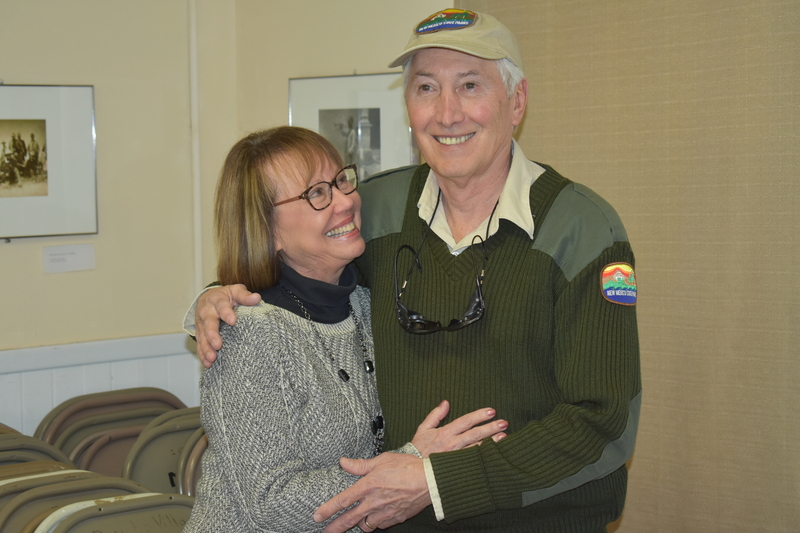 John did a great deal of flying as a young man with his Dentist father, who owned a Cessna 182 Skylane. 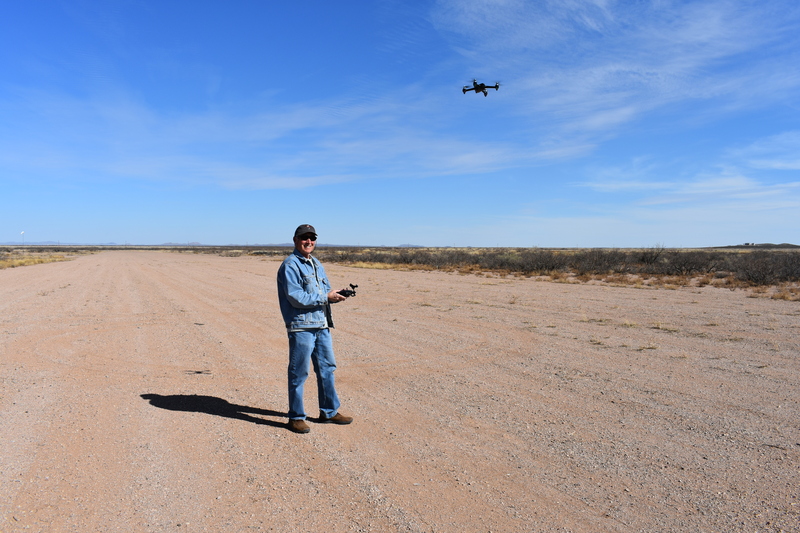 Today, he regularly flies drones over SW New Mexico and shoots airborne videos, which can be seen on YouTube. 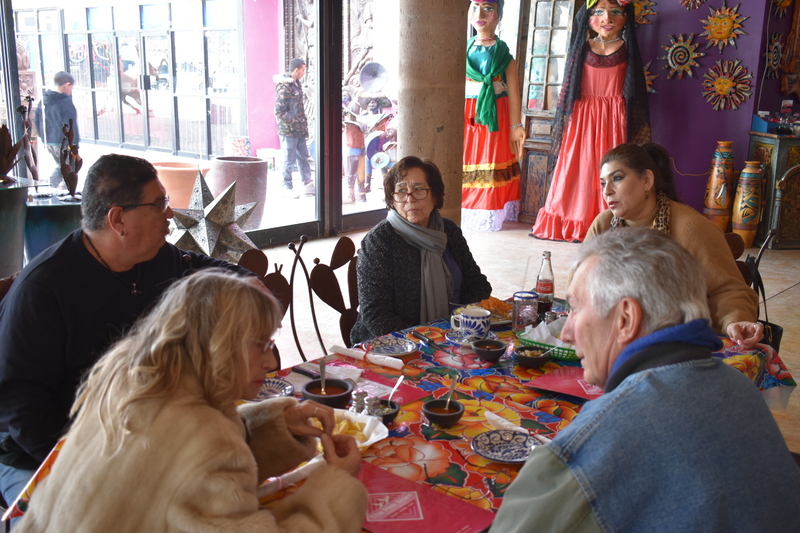 Mr. Read explains some of the little known background history behind the involvement of Germany in the Mexican Revolution during the early part of the last Century. 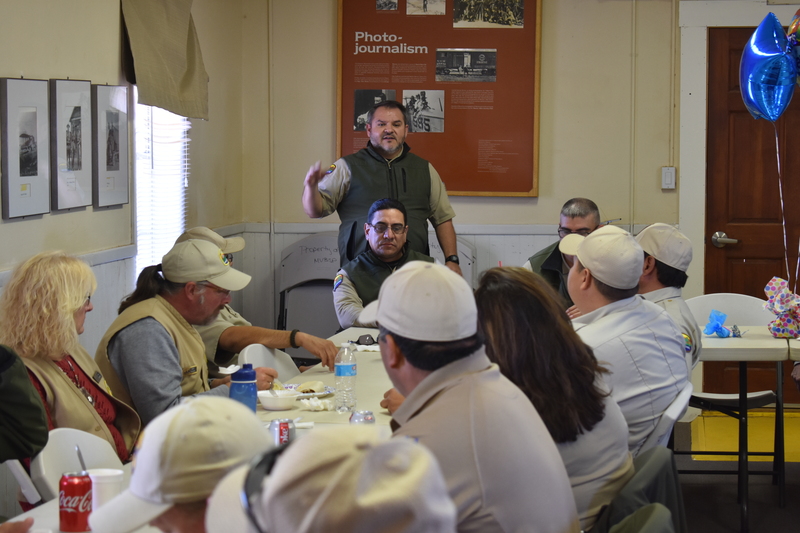 Daedalian members, all also FASF members, listen to Read’s description of the Expedition and why Pancho Villa may have rationalized or justified his attack on his former ally, the United States. 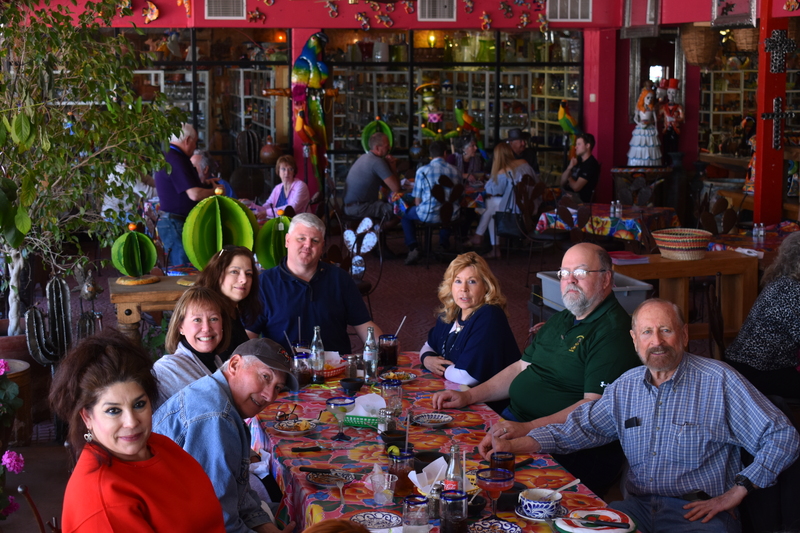 John explains some strange and largely unknow history about the infamous Pancho Villa Raid on Columbus, which gave rise to the birth of American Air Power, when the First Aero Squadron launched its operations into Mexico in pursuit of Pancho Villa from Columbus. 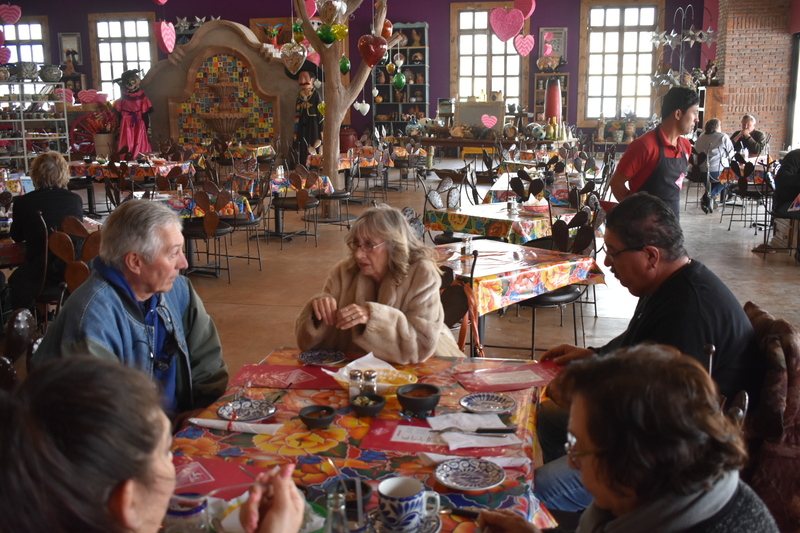 Another view of John, as he explains how the Germans tried to convince Pancho Villa and the Mexicans to make war on the United States, in order to keep it too occupied to bother getting involved in WWI in Europe. 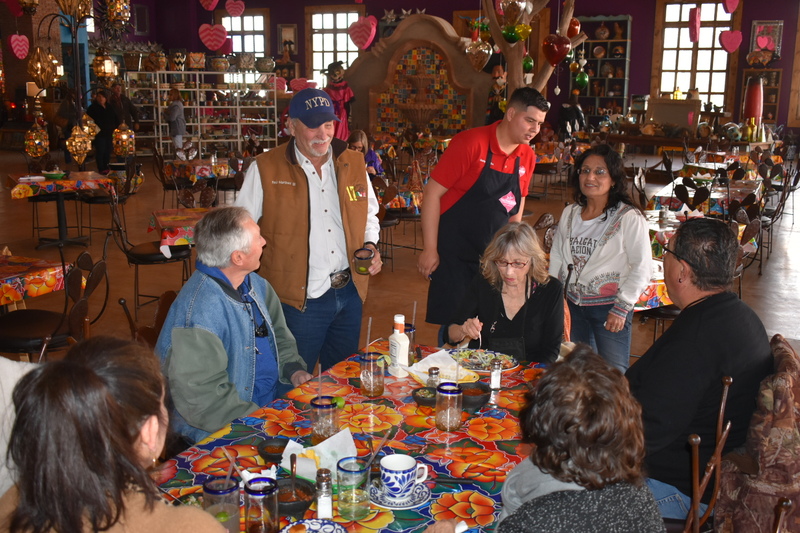 Notice, to John’s left stganding by the window, one of the regular Mexican-American Club waiters, who was especially interested in learning things he’d never before heard about the Mexican Revolution – – – and Villa’s Raid on Columbus. 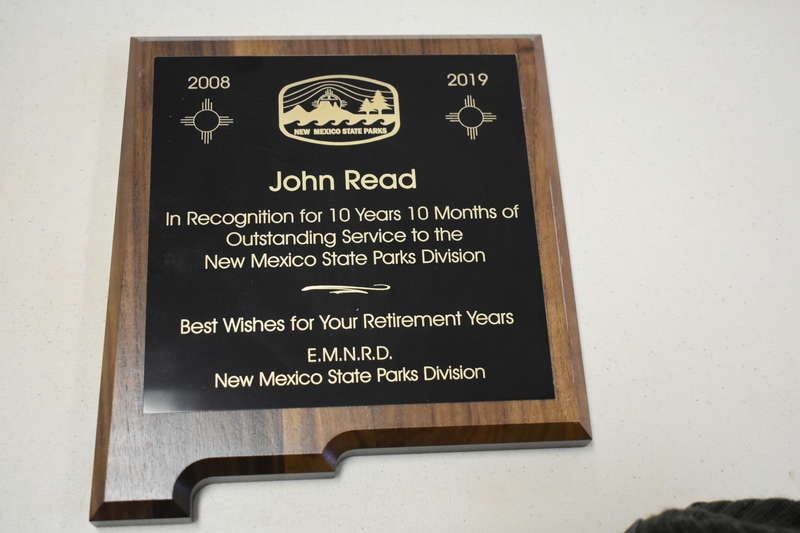 He expressed his appreciation to John after the meeting. John shows the Daedalians a copy of a “smoking gun” Telegram, sent by the Germans, to Mexico’s Revolutionary leadership. 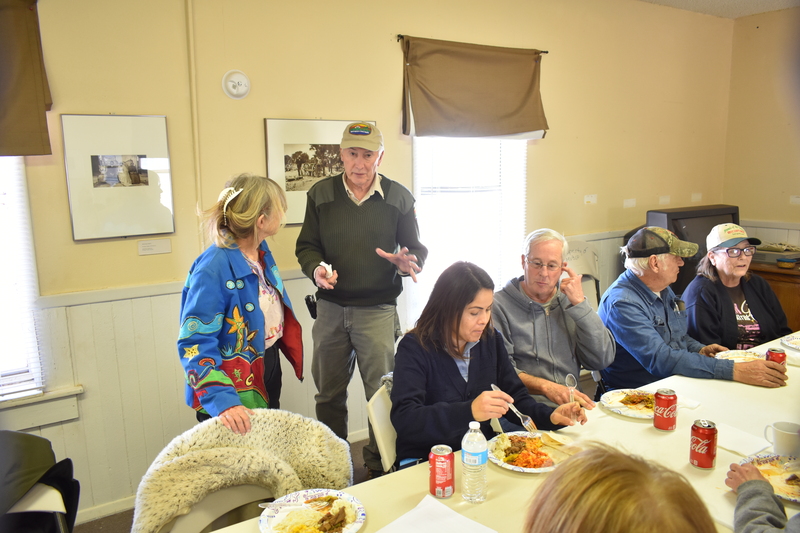 At far left, FASF member and Daedalian, Charlie Overstreet (USAF), asks questions about the German involvement with the Mexicans during 1916 -1917 period. 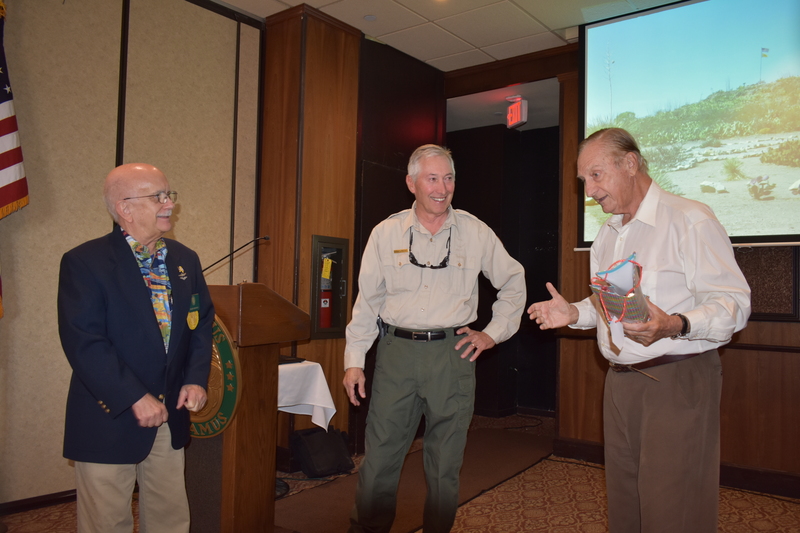 L to R after Charlie: Dave Ginn (US Army), Colonel Mario Campos (USAF) and Colonel Bob Pitt (USAF). 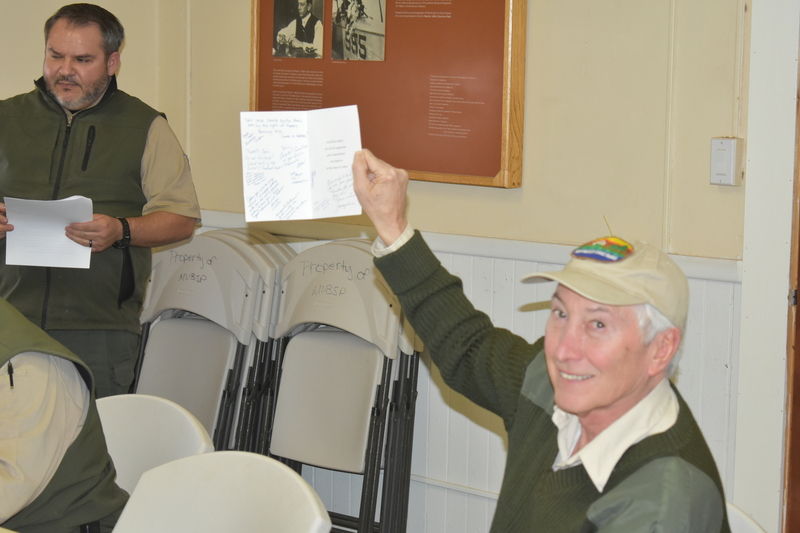 At the end of his presentation, Colonel Bob Pitt (right) gives a token of appreciation to Mr. Read for taking the time to make the special presentation. 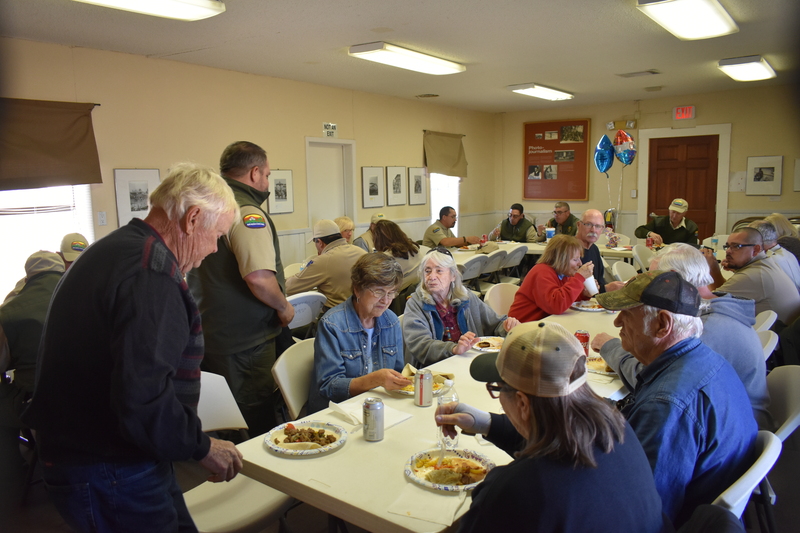 To the left above is Flilght Captain, Roger Nichols, a former Air Force pilot. 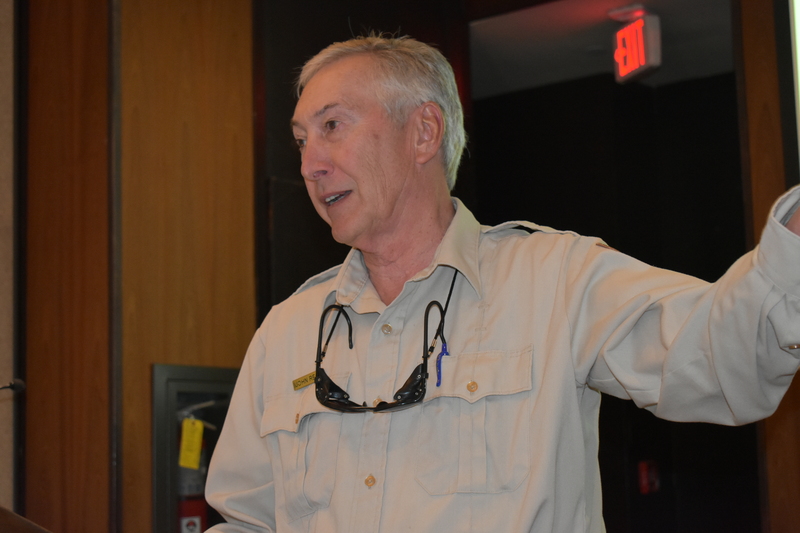 Colonel Pitt , also a USAF veteran, was wounded while flying a jet fighter in combat over Vietnam during that conflict. This entry was posted in AVIATION NEWS, HOT NEWS! and tagged Daedalian Flight 24, El Paso TX, John Read on November 4, 2018 by FASFRIC. While we’ve all heard of the new DRONE rage, have we ever before seen anything even approaching this sort of orchestration? Hardly. This TIME Magazine special cover event seems to be a first for such an extravagant enterprise – – – 1,000 individual Drones flying in perfect synchronization in order to achieve the desired result. Just imagine creating the software to bring this plan to a successful reality. Without further ado, here is the short (4:28 long) video of not only the final effect of the project, but of a fascinating insight into the behind-the-scenes efforts that made it all possible. Some of our FASF Drone enthusiasts, such as Bob Wright, John Read, and Warren Talbot have already created some footage for our site, so if any of you out there have some interesting airborne videos from your Drone flights, please let us know and we might be able to share those videos with our viewers right here, too. Remember, the U.S. Military is already deeply involved in the use and development of their own DRONE technology. All branches of our Military establishment, however, prefer their own nomenclature for their DRONE ops, preferring to call them UAV’s (Unmanned Aerial Vehicles) rather than Drones. The Army and Marines are using UAV craft as small as an insect, to as large as the GLOBAL HAWK and even full-sized multi-engined aircraft. The earliest genuinely successful DRONE or UAV technology was likely first experienced during WWII with the use of DRONES (as they were then called) for target towing missions, but this soon evolved into actual combat applications (see videos below). When one considers that modern computer technology was not available in that era, what was done with simple radio remote controls is impressive. Here, again below, are some short videos to show how DRONES were used, long before either computers or even TV were known to the general public. This first video is 1:24 in length. As early as WWI, aviation designers and engineers could see the advantages of UAV’s, so had begun work on the concept. In the post WWI era, and especially in the 1930’s, a great deal of effort, some of it even successful, was undertaken in Great Britain, by the Royal Navy. In 1933, a modified floatplane called Fairey Queen was tested as the first flightless drone aircraft. It crashed on two out of three trials, but by 1934, Queen Bee, a modified Tiger Moth aircraft, followed with greater success. Training gunners on these rudimentary models wasn’t a very realistic simulation, but a solution was soon to come from the United States in the form of British-born actor Reginald Denny, and his Radioplane Company. After years of trying desperately to interest the US Navy in the Radioplane-1, Denny finally succeeded in 1939, and over the course of the war some 15,374 models of Radioplane were built. As an interesting aside, did you know that film star Marilyn Monroe once worked assembling these radio controlled UAV’s? At that time, her later movie name wasn’t yet part of our culture, so, at Radioplane, she was known as simply Norma Jeane Dougherty, the 18 year old wife of a U.S. Merchant Marine Seaman. Fast, agile and durable, Radioplanes were fitted with responsive radio controls and were better able to mimic the speed and agility of enemy fighters. Even during the D-Day summer of 1944, the Allies turned to high-stakes DRONE warfare. Under the code name Operation Aphrodite, radio-controlled bombers were packed with explosives and guided into the air by Allied pilots instructed to eject before their planes reached high-value targets in territory controlled by Nazi Germany. (Killed on one of these treacherous missions was the Navy aviator Lt. Joseph P. Kennedy Jr., older brother of U.S. President John F. Kennedy). 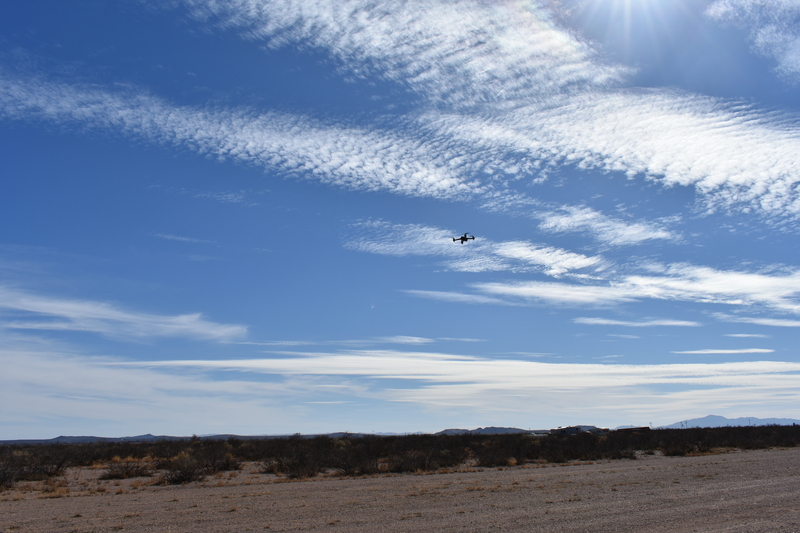 As for the advent of and actual deployment of the new variety of “insect sized” UAV’s, that will have to wait for a later post, but here is some descriptive material about that avenue of research right here. This entry was posted in AVIATION NEWS, HOT NEWS!, NEW VIDEOS and tagged 1000 Drones Make Huge Photograph in Sky, Bob Wright, Culver Aircraft Company, Culver Cadet, Culver PQ-8, Drone, Fairy Queen, Global Hawk, Great Britain, John Read, Lt. Joseph P. Kennedy Jr., Marilyn Monroe, Merchant Marine Seaman, Mooney Mite, Norma Jeane Dougherty, President John F. Kennedy, Queen Bee, Radioplane Company, Reginald Denny, Royal Navy Flying Corps, Tiger Moth, Time Magazine, UAV, USN, Warren Talbot on June 3, 2018 by FASFRIC. 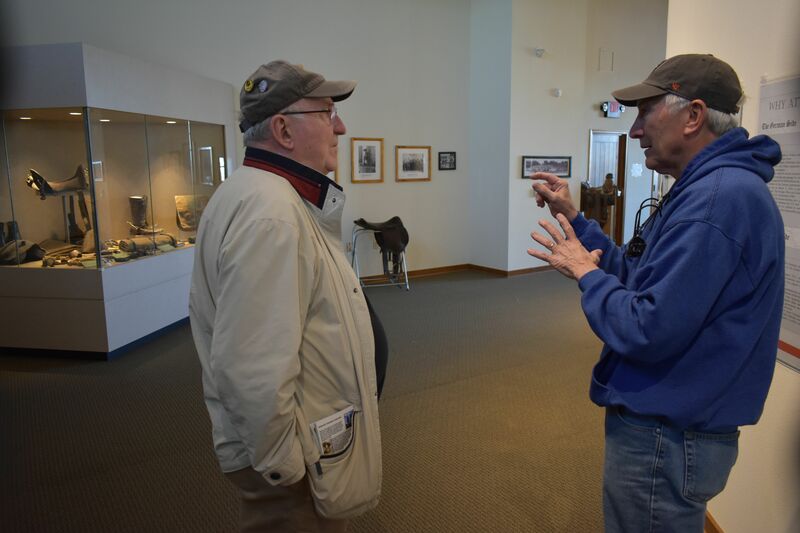 Colonel Don Patton, US Army Retired, who is one of the founders of the Dr. Harold C. Deutsch WWII History Round Table in Edina, Minnesota, a suburb of Minneapolis, dropped by to visit the First Aero Squadron 1916 Airfield here in Columbus, yesterday. 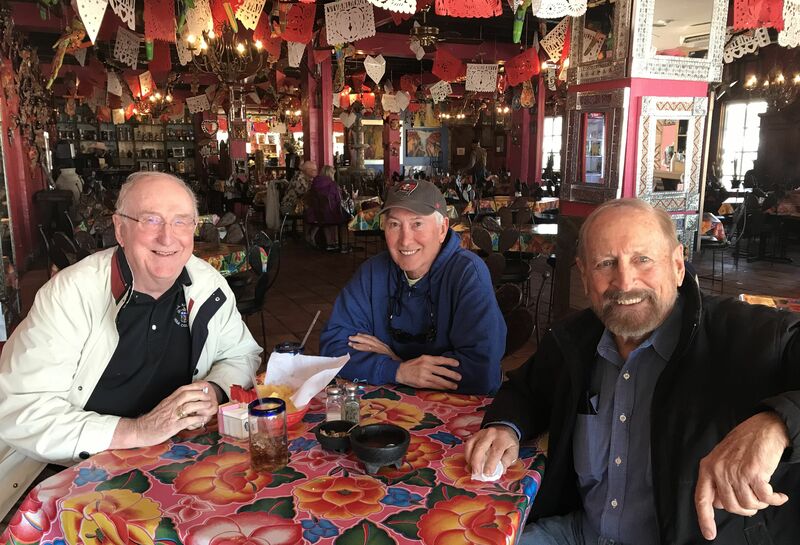 After touring the FASF Headquarter’s Office, and the Airfield, Colonel Patton and Ric Lambart picked up another FASF long time member, John Read, Manager of the Pancho Villa State Park in Columbus, and went to Palomas, Mexico to have lunch at the world renown Pink Store. 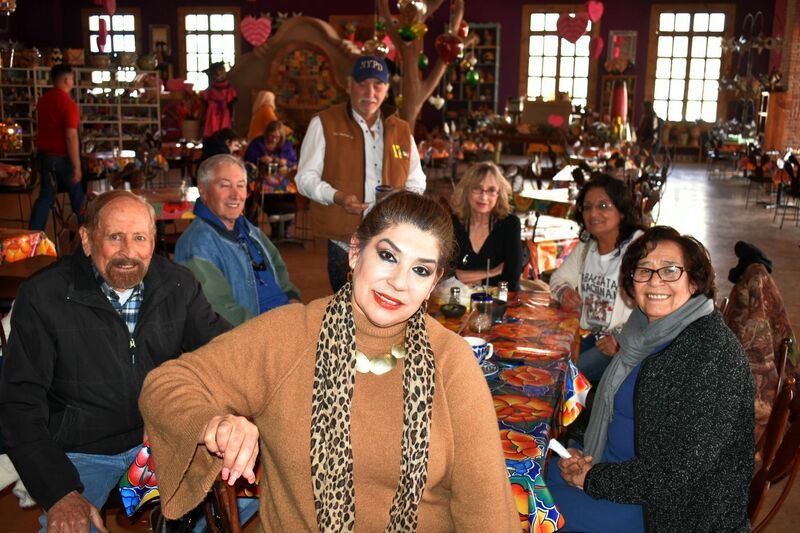 The picture below, of Col. Patton, John Read and Ric Lambart was taken by another long time FASF member, Yvonne Romero (scroll down to the Pink Store), the creator – and owner/manager – of the Pink store. Any of the below photos can be seen in full-size by simply clicking on them. Col Patton standing by the wind-sock pole at the 1916 Airfield with Columbus in the background. 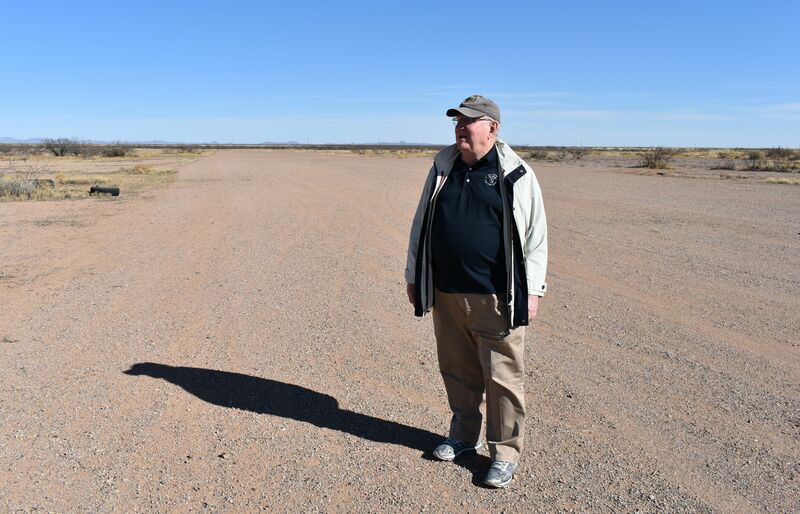 After his visit to Columbus and Palomas, Mexico, Colonel Patton departed for Holloman Air Force Base, to join his son, Colonel Jeff “Tank” Patton, USAF, who commands the Base’s 49th Operations Group at the Air Base. 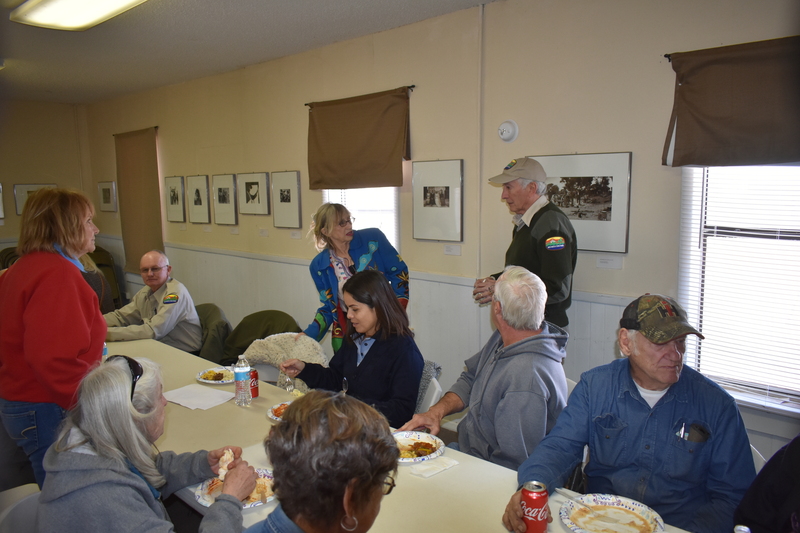 After touring the Pancho Villa State Park with John Read, the Colonel visited the home of Richard and Betty Dean. 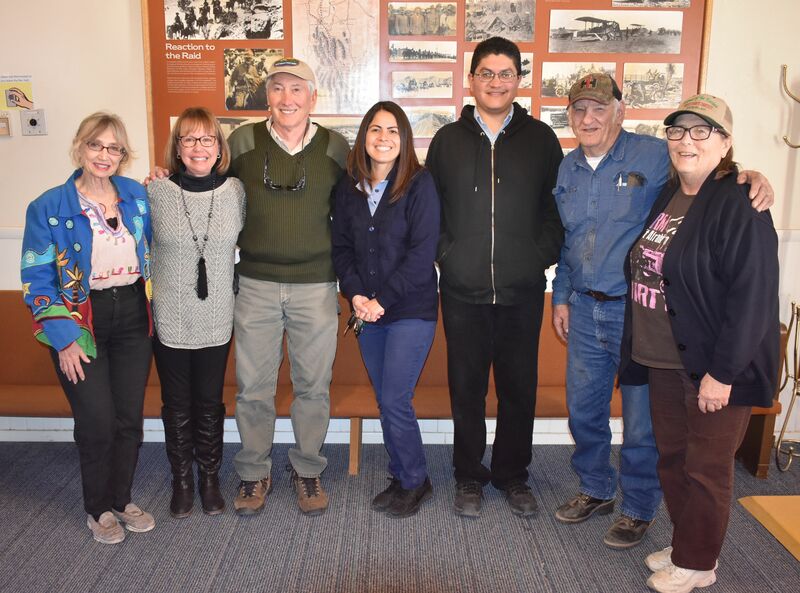 Dean is considered to be the foremost local historian on matters related to the infamous raid on Columbus in 1916 by Pancho Villa and Richard is also the President of the FASF’s sister organization, the Columbus Historical Society, which operates the well known “Depot Museum” in town. Mr. Dean’s great-grandfather was one of the victims of Villa’s marauders on March 9, 1916. 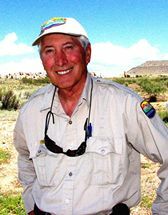 Dean has appeared on both PBS specials about the Raid and also on other national TV networks regarding the same infamous historical event. Col. Patton standing on the E-W Airfield Runway. The view is to the East towards El Paso, Texas. 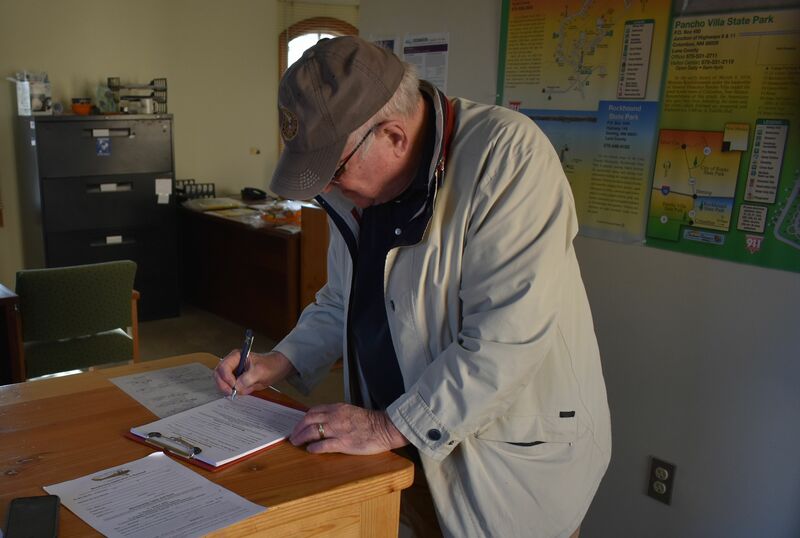 Colonel Patton fills our his FASF Membership Application. 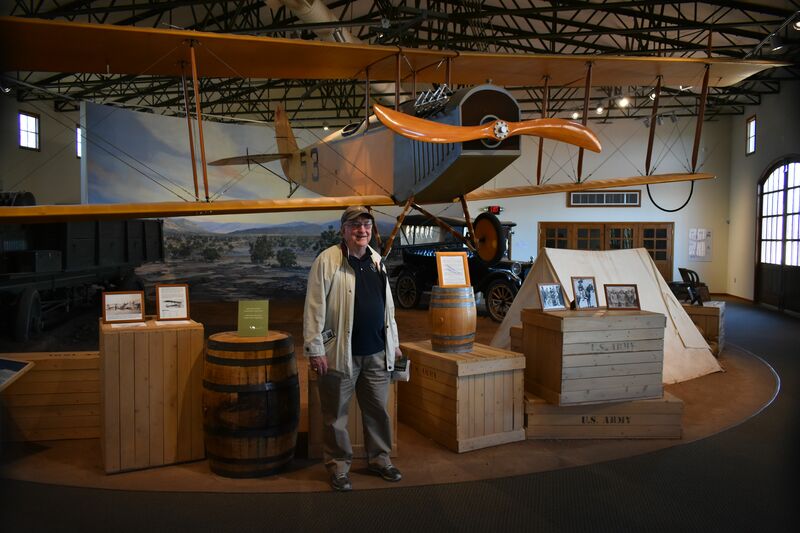 Colonel Patton poses in front of the Pancho Villa State Park’s historic Curtiss JN-4 Jenny Airplane. 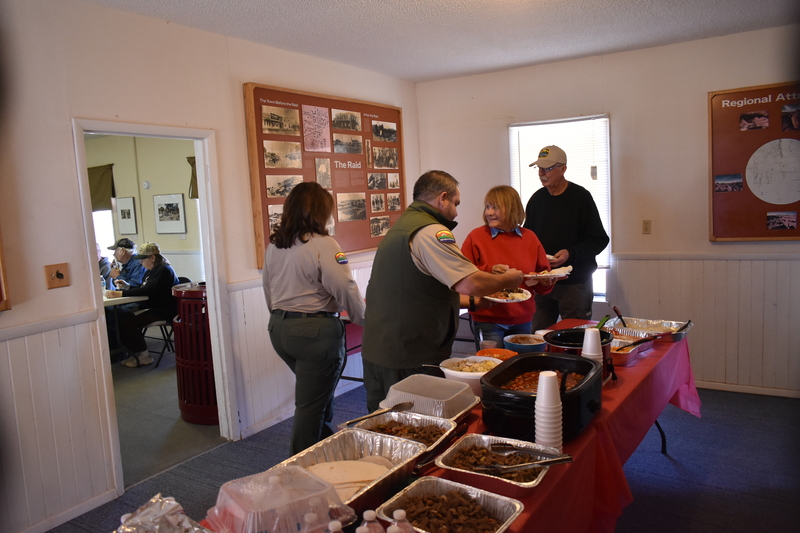 L to R: John Read explaining some of the historical facts about the infamous raid of March 9th, 1916 by Pancho Villa, Col. Patton. 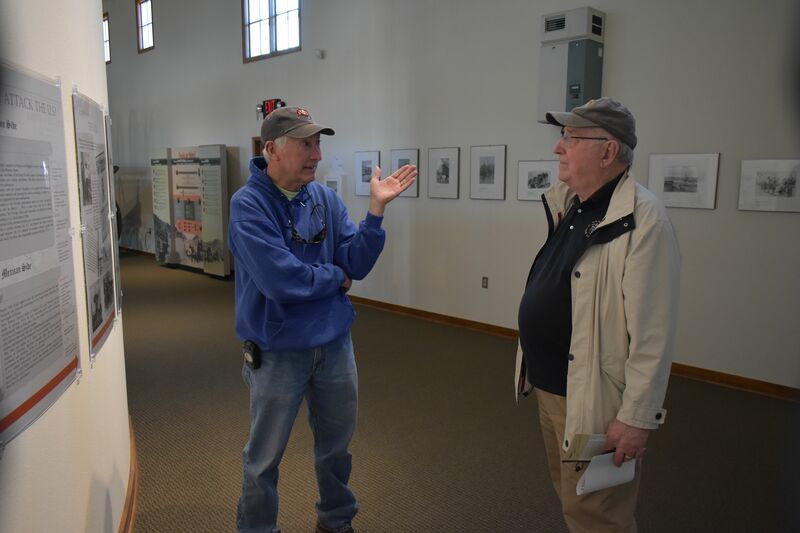 L to R: Col. Patton listens to more about the 1916 Raid from John Read. L to R: Col. Patton listens to John Read explain how this 1914 photo of U.S. General Black Jack Pershing, with Pancho Villa has most often misidentified his Aide de Camp as Lt. Patton (later General George Patton of WWII fame – who was involved with Pershing in the 1916 Punitive Expedition, but was not in that particular photo. 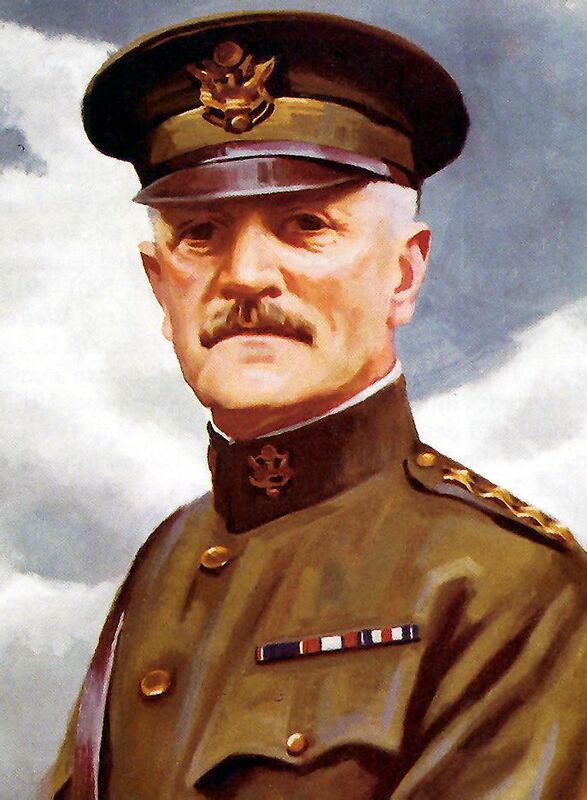 The man so often misidentified as young Patton, was actually the General’s Aide de Camp, Lt. James Lawton Collins, who sometime after WWII also became a Major General himself.). Our new member is not related to General George S. Patton. 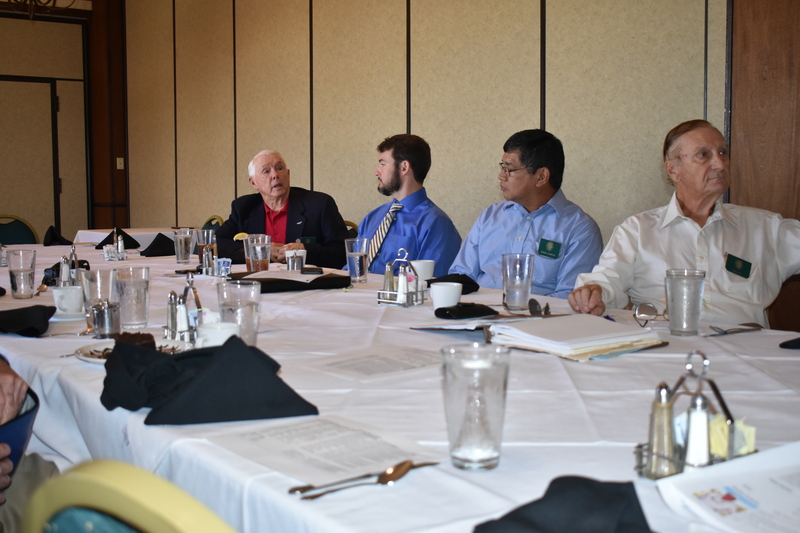 Colonel Patton had recently booked one of our long time Advisors, Dr. Roger Miller, former Deputy Historian for the United States Air Force, to speak to his WWII Round Table in Minneapolis, Minnesota. 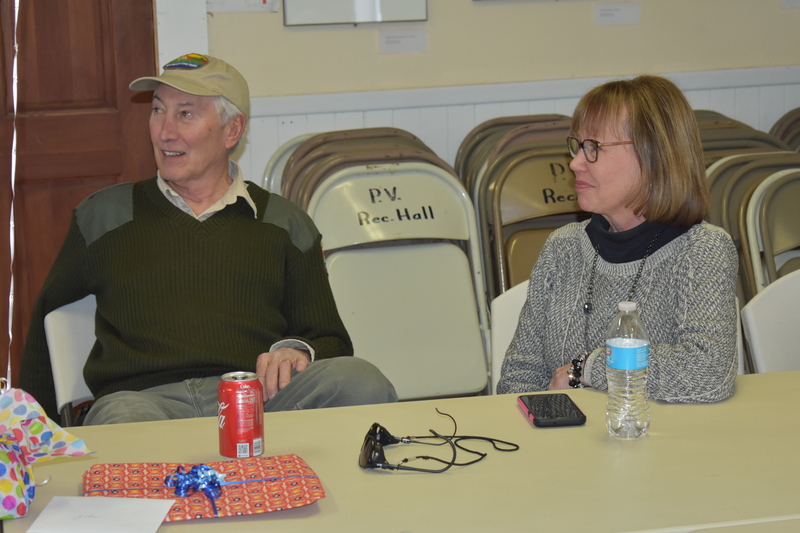 Dr. Miller made presentations about both the First Aero Squadron’s involvement in the 1916-17 Punitive Expedition, and also the Berlin Airlift. Both topics are specialties of Dr. Miller’s. The former USAF Historian has also authored some well known books on both those episodes of U.S. History. This entry was posted in HOT NEWS! 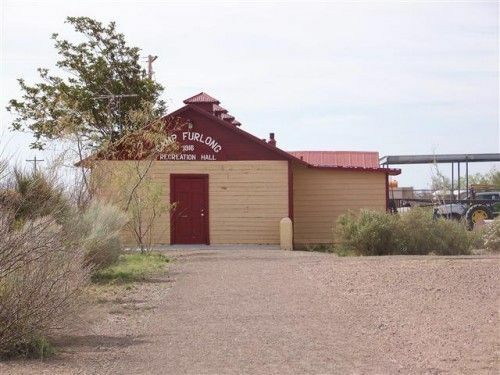 and tagged Colonel Don Patton, Curtiss JN-4 Jenny, FAS 1916 Airfield, John Read, Pancho Villa State Park NM, The Pink Store of Palomas Mexico on February 23, 2018 by FASFRIC. Remember to turn up your volume to hear the above video! 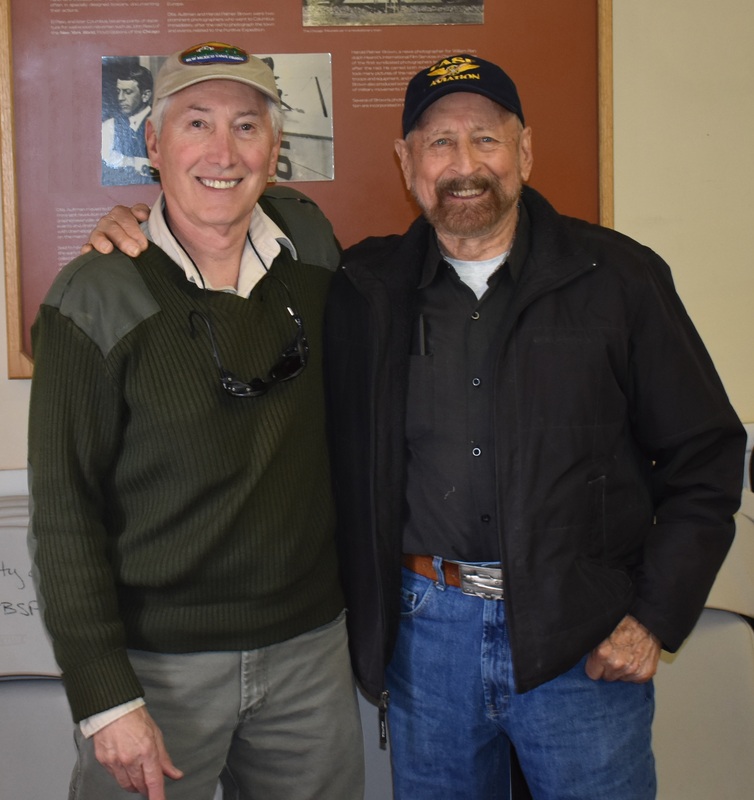 The United States Air Force flew Dr. Roger G. Miller to Columbus, New Mexico, to deliver this 58 minute presentation in commemoration of the Birth of American Air Power. 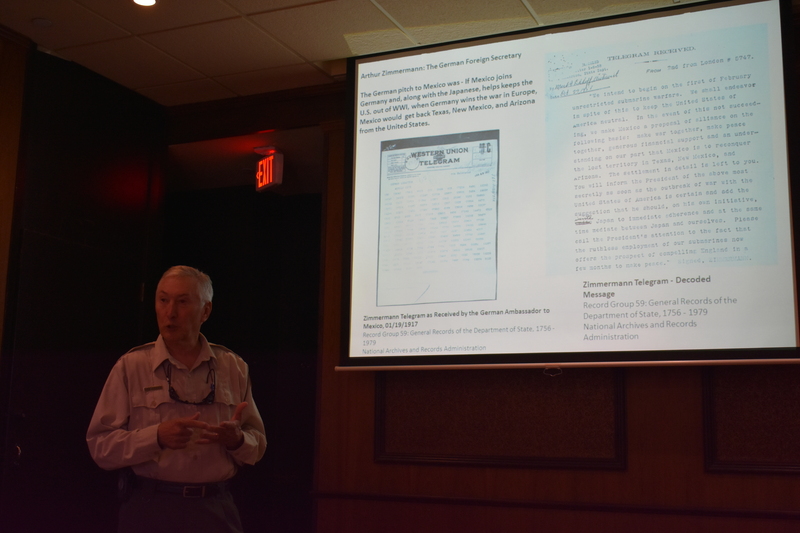 Dr. Miller’s fascinating slide show included many before unseen 95-year-old archival photographs taken in Columbus during the launching of America’s first sustained military aviation operation. This Army aircraft engagement was part of the legendary “Punitive Expedition” into Mexico sent out of Columbus in retaliation for the nighttime March 9th, 1916 raid on the town by Mexico’s revolutionary General Francisco “Pancho” Villa and his troops. Before Villa’s three hour attack was over, he had lost almost a quarter of his some 400 men to the fierce American gunfire that ensued from the local Army garrison’s soldiers, but many buildings had been burned to the ground by the invaders and 18 U.S. soldiers and civilians had been slaughtered. Not only was the retaliatory Army campaign considered the launching of what is now the world’s greatest Air Power, but many give the military engagement credit for instigating what also became the leading civil aviation power in the world. While the early Columbus aircraft deployment is best known for its military contribution, the subsequent entry of the United States into Europe’s World War I had a great deal to do with the postwar explosion of civil aviation in the states as well. Why? Because the veritable Curtiss “Jenny” biplanes used out of the Columbus airfield were mass-produced by the United States and Canada for several years during WWI in order to train thousands of young American and Canadian men to be military pilots. The Great War was soon concluded in 1918, and because the thousands of Jennys were no longer needed, they were quickly sold by the government as surplus at the end of that deadly conflict. 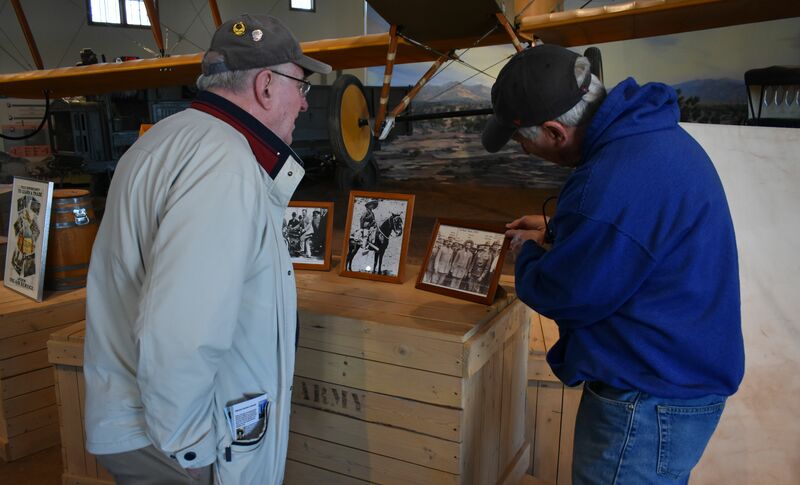 Many young Army and Navy pilots, who were fortunate enough to come home intact from the bloody fields and skies above Europe, had fallen in love with the exciting experience of flying and they enthusiastically purchased the surplus biplanes for as little as $200. It was these sturdy “Jenny” aircraft that quickly became the backbone of U. S. civil aviation, as they were soon profitably carrying “Airmail” for the Federal Government. They were also flown all across the states from the Atlantic to the Pacific by the ex-military pilots in what has become known as the American “Barnstorming” era. 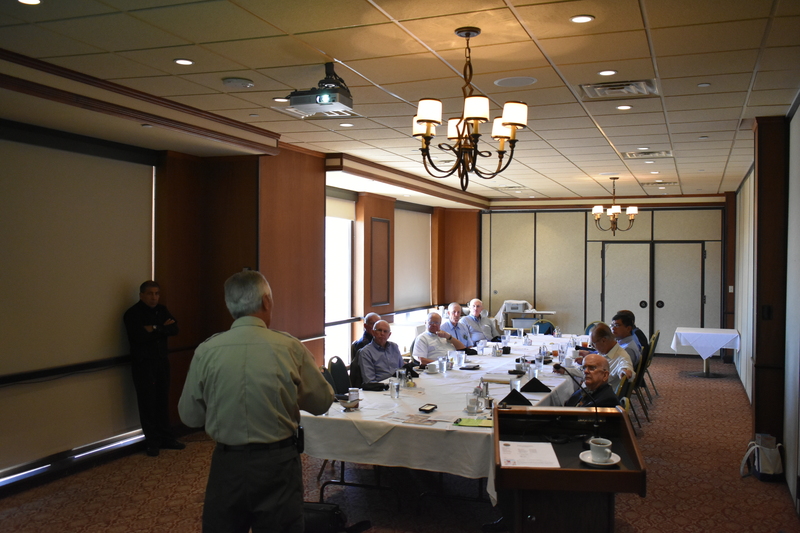 Dr. Miller’s presentation is a colorful and exciting introduction into that great historical military experiment which is considered to be the Birth of American Air Power. Although the Wright Brother’s are universally given credit for the first successful powered flight in 1903, the United States quickly fell behind the Europeans in aircraft innovation and development. In fact, while the veritable “Jenny” airplane made a fine flight training aircraft (over 8,000 of them were mass-produced), it proved no match for any of the military airplanes used in the Great War, resulting in the Curtiss Jenny biplane being restricted to non-combat pilot training in the United States and Canada. When our pilots arrived to battle the Germans in that bloody conflagration, they were compelled to fly either the significantly superior French or British flying machines. Soon after the end of hostilities on the Continent, however, things quickly changed, with the lessons of the “war to end all wars” taken to heart, American aircraft manufacturers sprung up around the country in a fierce competition to produce better, safer – and faster – airplanes. The U. S. soon leapt ahead of the European nations in its capacity to produce genuinely safe modern airplanes – – – for both civilian and military purposes. And, with virtually no lapses, the United States has successfully maintained that position of world leadership in both aviation and its evolution into space flight. 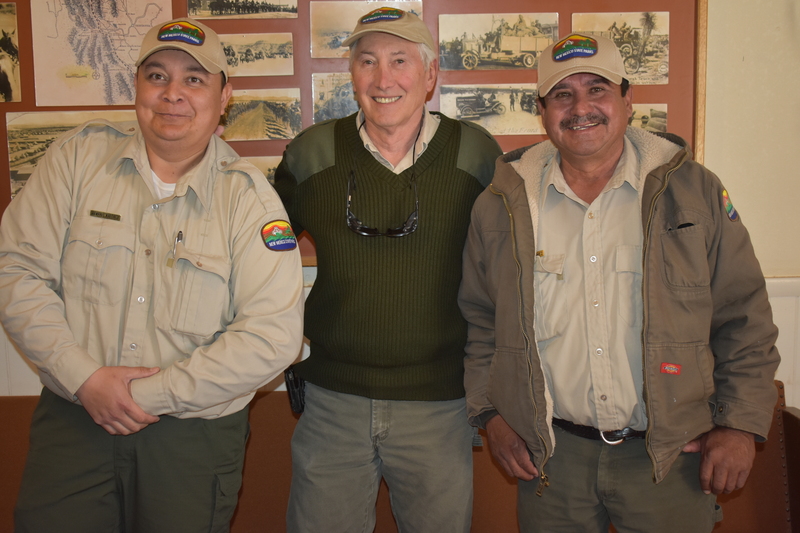 This video would not have been possible without the great assistance and hours of effort put in by the following local Columbus FASF members: John Read, now Pancho Villa State Park Chief Ranger; Allen Rosenberg (a founding member of the FASF!) 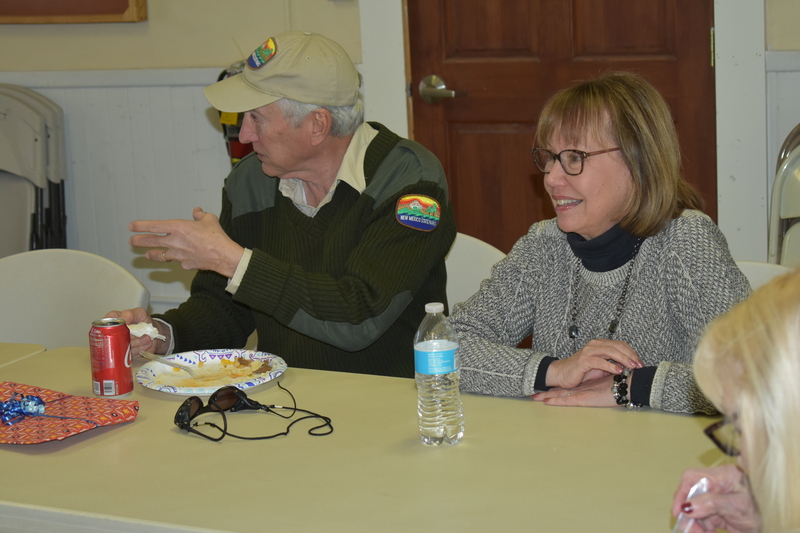 and Larry Miller, who worked together doing the videography; former FASF Trustee and Secretary of the Board, Bud Canfield and his wife, Jeane, who handled all the catering for the entire event, and Wayne and Debbi Evans, who handled all the vehicle parking duties. 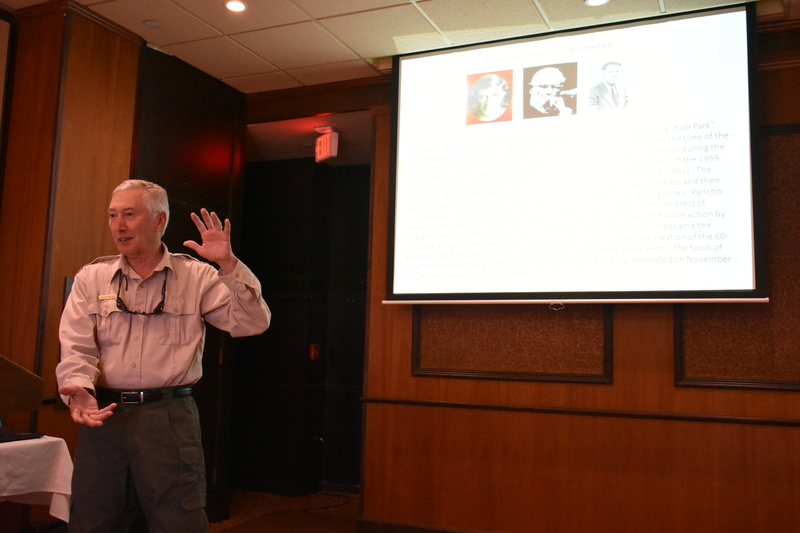 This presentation by Dr. Miller was the first public program staged by the FASF and it was a true sell out. The attendees soon filled the small auditorium and spilled out into the main Exhibit Hall. 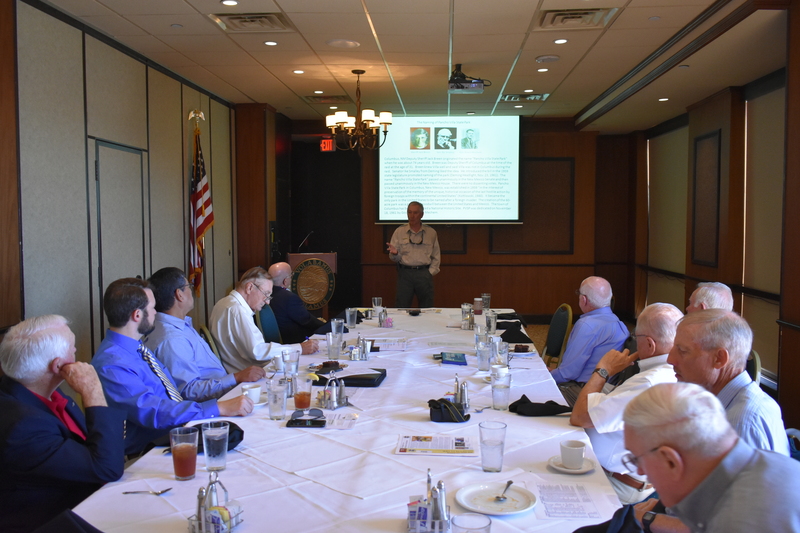 Last, but not least, of course, was the fascinating presention by our guest, Dr. Roger Miller, USAF Deputy Historian and the USAF, which made his visit possible. 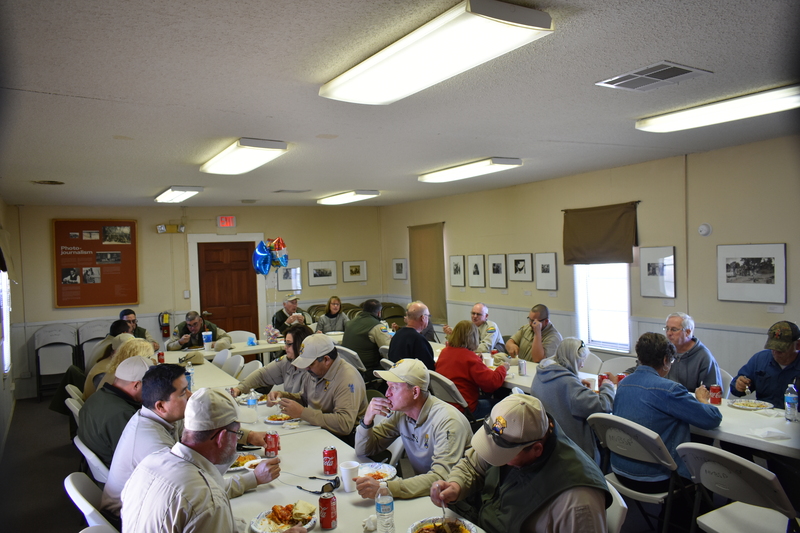 Roger, John, Allen, Larry, Bud and Jeane, and Wayne and Debbi! This entry was posted in NEW VIDEOS and tagged Allen Rosenberg, Birth of American Air Power, Birthplace of American Airpower, Bud and Jeane Canfield, Columbus NM, Columbus NM Rebirthplace of American Civil Aviation and it's wold dominance, Deputy Historian for the USAF, Dr. Roger G. Miller, John Read, Larry Miller, March 9 1916, Pancho Villa Raid on Columbus, Punitive Expedition, Wayne and Debi Evansk on June 29, 2015 by FASFRIC.